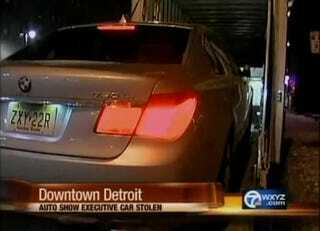 Tired of their usual fare of Cadillac Escalades, Detroit's car thieves raised their sights Wednesday night by stealing a BMW 7-Series that the automaker had hauled in for the show. The 7-Series, valued at somewhere between $90,000 and $140,000, was one of 19 cars BMW brought to the show to haul executives around town. (And yes, every automaker does this; there would be nothing so shameful as to arrive at an auto show in some other maker's car, even when your top-end company ride is a Volkswagen Routan.) The jackers swiped the sedan as it was being loaded on a hauler across the street from a downtown hotel. The BMW comes with a tracing system standard, which should give police some clues. Also on the side of the law: The sheer impossibility of taking any part off a BMW 7-Series without at least two hours of labor.